Hi! My name is Berry! I am a brand NEW addition to the ever growing Cuski family ... another lovely colour to collect! I am a beautiful bright purple and will be ready to give out lots of hugs very soon! My 10 month old son adores his cuski. He uses it at sleeping time. He always has a hand on it and it's touching his face. As soon as he gets into the cot he reaches out for it. Disaster accrued when cuski was lost one day. A new was delivered the next day after an unsettled night! My advice is to buy two. Great product. I cannot fault this product or company. My baby absolutely adores her Cuskis, so much we have several of them, pinkee, minty and berry. They are small enough to fit in a bag and carry around and great for babies to start grabbing and holding onto. We bought our Granddaughter Eve her Cuski when she was 4 months old. We bought 2 at the same time, 1 to use while the other 1 was in the wash. Eve never had a dummy from being born, She's nearly 15 months old now, and we've just bought another Cuski to have at our house. She settles much easier with her Cuski, loves to cuddle it, and when she's teething , the end of the hat gets chewed on constantly. I would totally recommend Cuski, my advice would be to buy 2 together. My little girl has two berry cuski's, or cuggi's as she calls them! Both she has had from birth and she had never slept without them, gorgeous product and good quality. Love ur work! My little ones have all grown and developed with Cuskis they have been such a big part of their young lives,have helped through illnesses, separations and most importantly sleep issues which affect all the family. 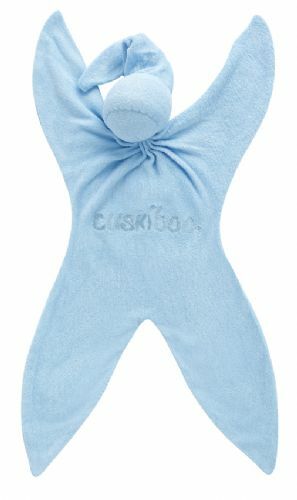 I now buy Cuskis as new baby presents and they are so well received and appreciated because new babies all relate with a Cuski and, new mums really love them as an original and unique present. Berry is the newest colour and so fresh and plush, my favourite choice for a girl and Minty for a boy. Give a Cuski as a present and they are so loved, I have been buying these little guys since 1999, thank you Cuski.